Check out this Daniel Jones hype video as the 2018 season approaches. 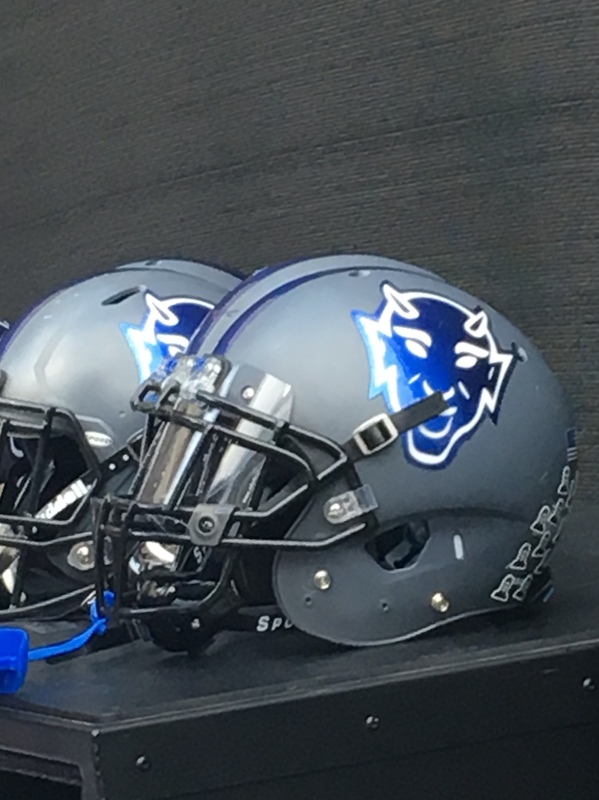 DURHAM, N.C. – Five student-athletes – Zamari Ellis, Casey Holman, Gunnar Holmberg, Jeremiah Lewis and Jack Wohlabaugh – have joined the Blue Devil football program, head coach David Cutcliffe announced on Wednesday in conjunction with the beginning of Duke’s spring semester. Ellis, a 6-4, 240-pound tight end from Henderson, N.C., is a consensus three-star prospect and rated as the No. 27 tight end in the nation by Rivals.com. The No. 27 tight end in the country by Rivals.com, was named to the 2016 USA Today N.C. all-state first team before missing his senior campaign at Southern Vance due to a foot injury. Holman, a 6-4, 285-pound offensive lineman from Snellville, Ga., was a first team all-region pick by the 7-AAAAAA coaches as both a junior and senior. During his final campaign, Holman, from Brookwood High School, was named the Touchdown Club of Gwinnett Co-Offensive Lineman of the Year and led Brookwood to an 11-3 record, including a 6-0 region mark to win the Region 7-AAAAAAA title. Holmberg, a 6-3, 180-pound quarterback from Wake Forest, N.C., is a four-star prospect and ranked as the No. 26 pocket passing quarterback in the nation by ESPN.com. He set the Heritage High School single-season records with 2,730 passing yards and 26 touchdowns as a senior while leading the Huskies to a 12-2 record and a berth in the North Carolina High School Athletic Association 4A state quarterfinals. Lewis, a 6-0, 180-pound cornerback from Plano, Texas, helped Prestonwood Christian High School to the Texas Association of Private and Parochial Schools (TAPPS) Division I state championship game three times, claiming the title twice including the 2017 crown. In his final high school game, Lewis and the Lions rallied from 18 points down in the third quarter to defeat St. Pius X, 42-41, to claim the program’s fifth TAPPS state title. Wohlabaugh, a 6-4, 295-pound offensive lineman from Akron, Ohio, spent the 2016 and 2017 seasons with the Ohio State University before transferring to Duke. An Academic All-Big Ten selection following the 2017 campaign, Wohlabaugh will sit out the 2018 season due to NCAA transfer regulations and have two seasons of eligibility beginning in 2019. He did not see game action in his two seasons with the Buckeyes. Duke finished the 2017 campaign with a 7-6 overall record including a 36-14 victory over Northern Illinois in the Quick Lane Bowl. 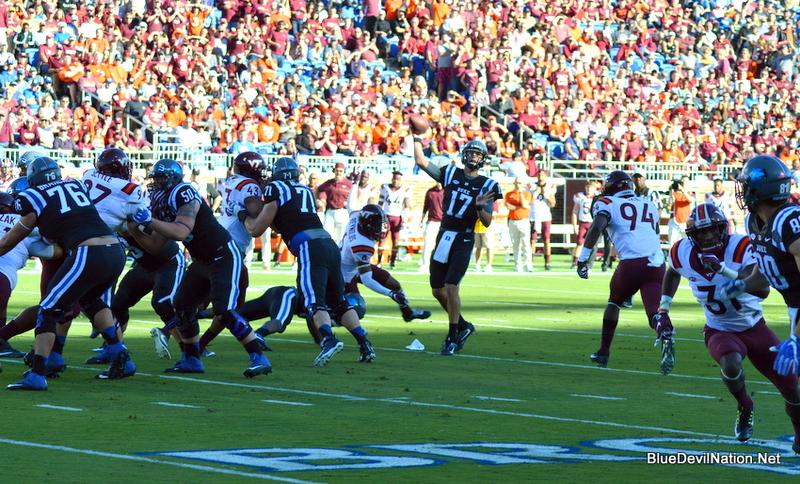 The bowl game appearance marked the Blue Devils’ fifth in the last six seasons. Duke will open the 2018 season on September 1 at home against Army West Point. But it was the defense which set the tone for a victory and finishing the year with three consecutive wins. Duke had jumped out to a 14-0 lead and it looked as if the team had the game in the bag. But Northern Illinois would get two quick scores which tied the game up at 14-14. You could not help but wonder at that time if Duke would regain momentum. After all, they had experienced a six game losing streak before gaining two ACC conference wins to close the season and propel them to a bowl. The losing streak was as much mental as it was getting the job done on the field. But on this day, Duke showed that lessons were indeed learned. The team would shut out Northern Illinois the rest of the way. Still, Duke took a solid lead of 26-14 into the locker room and the defense showed the ability to stop big plays. While not a clean first half, it was a substantial lead to work with. The Huskies would never challenge again. 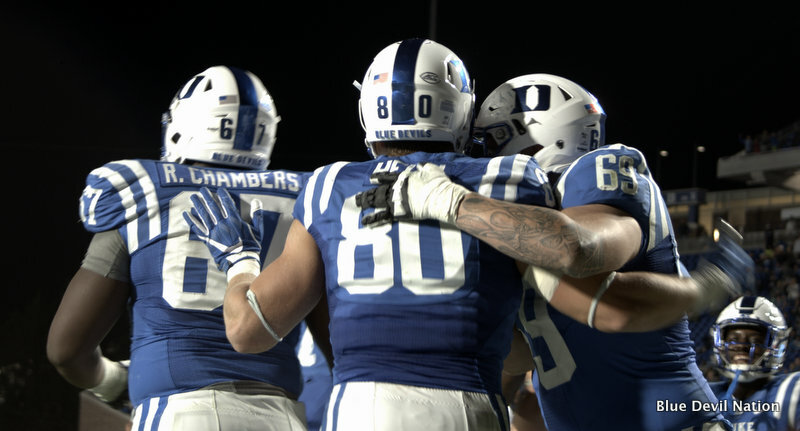 Duke went into ball control mode in the second half and would shut out their opponent When the dust cleared, Duke had outscored Northern Illinois 22-0 since the game was tied including a 10-0 advantage in the final two quarters. 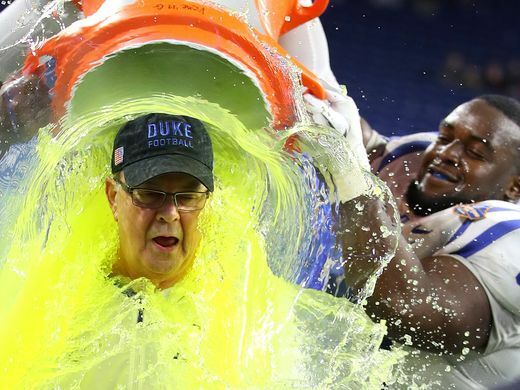 The Duke players celebrated by dousing head coach David Cutcliffe with Gatorade and then accepted the trophy which save the season. 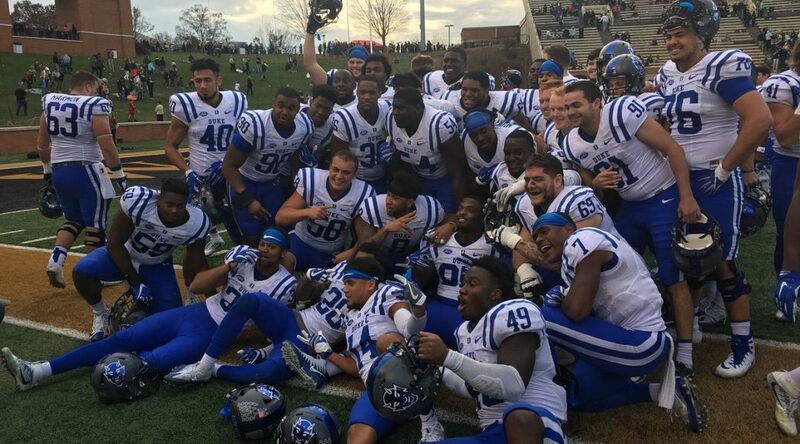 Duke had against all odds righted the ship late in the season and came away with a bowl win. The program can now say that it has been to bowl games in five of the last six seasons. And there is suddenly momentum to work with in the off-season. While Duke will lose some key senior players who went out in style, they return a strong contingent of personnel. The seniors were able to go out on a winning note, while the returning players will likely learn from the taste of defeat that was sandwiched in the middle of the year, Lessons will be learned and the players departing left getting Duke back on track with a bowl win. 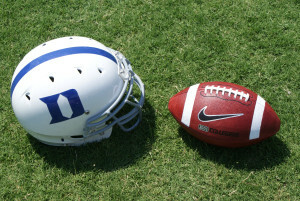 Duke will begin spring practice at the end of March this coming year. That time has been pushed back from seasons past. Duke will return 7 starters on offense and 8 on the defensive side of the ball but will have to replace the punter and the kicker as well. Duke will open the season at home with Army. 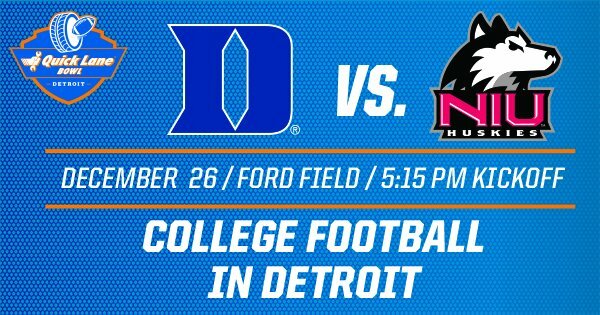 The Blue Devils have been invited to play in the Quick Lane Bowl in Detroit, Michigan against Northern Illinois on December 26th, 5:30 on Ford Field. Duke is quite happy to get an invite for a few weeks ago they were mired in a losing streak that was nothing short of depressing. But in the what have you done for me lately department; Duke has won two ACC games in a row in grand fashion. They can now gain some much-needed experience via extra practices for young players. Those reps will bode well for the future and a game plan for Duke is at its best when they have time to devise a scheme. Duke got an unexpected tough opponent in Northern Illinois. The Quick Lane Bowl is happy the Huskies fell here in that they now have what should be a competitive game. Had Duke been paired with Akron, they would have been heavy favorites. What we get in the Huskies is a physical team that looks very similar to Duke on paper. Each team has a running back with similar numbers and a solid defense. The Huskies led the MAC in defensive points allowed by a wide margin over most teams. The Huskies also bring recent success and tradition. In short, Duke must prepare well and for a physical game. They may have an edge in the speed department but Norther Illinois went into Nebraska and won this season -- something any team would have a difficult task in doing. But Duke did beat what is considered to be the best team in Illinois in Northwestern. In fact, they throttled the nationally ranked Wildcats before suddenly losing their team identity. As for the Huskies, they were one of two 6-2 (8-4 overall) teams in the MAC's best division. Their losses came on the road to Central Michigan and conference champ Toledo. They played Boston College to a 3 point game in their opener before tripping up in that game. The other loss came on the road at ranked San Diego State, meaning no bad loss. Duke left points on the field against Army, Virginia and Pitt and squandered their best chance in years to beat Florida State. But they discovered something in recent weeks and salvaged their season. It is called good old-fashioned offense and being aggressive on that side of the ball. It will bode well for Duke to play on artificial turf which better suits team speed. The last time Duke Football played in Michigan was 1978 by my recollection under then coach Mike McGee against the Michigan Wolverines. Per my memory, Duke has only played MAC teams twice in their long history. That was two wins over Ohio in 1985 and 86. This will obviously be the first meeting between Northern Illinois and Duke. There is a Dave Doeren connection at play. The N.C. State head man was at the school and led them to an 11-3 record and conference title in his first season. His 2012 team vaulted to No. 15 in the BCS Standings, which led to a first-ever appearance in a BCS bowl game, the 2013 Orange Bowl against Florida State, which they lost 31-10. Doeren was hired by the Wolfpack the very next day, but it was current coach Rod Carey who coached in that game. Northern Illinois has won 10 conference and three division titles, appeared in 13 Division I-A and College Division bowl games in their MAC history, Rod Carey took over for Doeren and led the Huskies to four west division titles from 2012-15. He was also a part of an NCAA high at the time 26 game home winning streak. The Blue Devils now return to a bowl game after a one year hiatus. Duke is 1-3 under head coach David Cutcliffe in bowl games. They broke through in their last win -- an overtime victory over Indiana in the Pinstripe Bowl. Previously, they lost three games that were all within reach. Where will Duke go Bowling and who will they play? 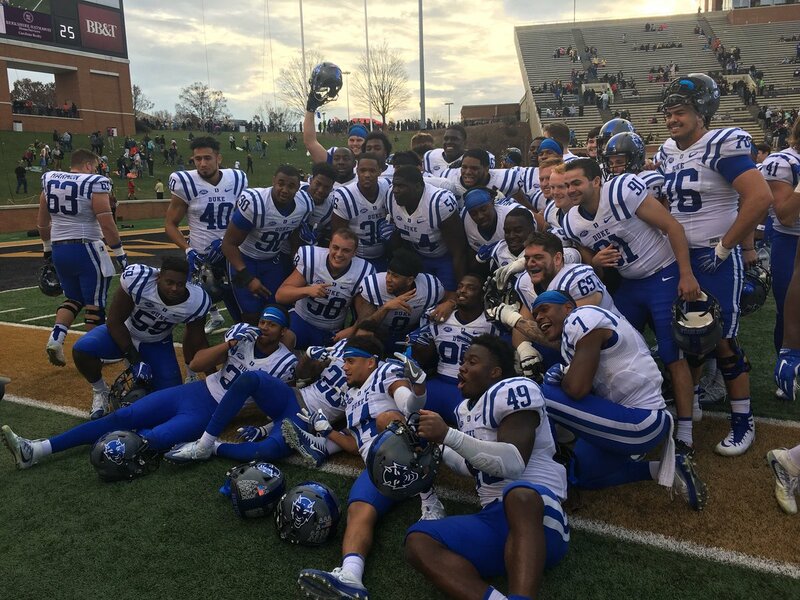 The Duke Blue Devils defeated Wake Forest 31-23 to become bowl eligible today. I checked in with my best sources and have the most likely destinations and the opponent which they may play. A match up of basketball giants who have turned their football programs around in recent years. Missouri is a possibility here. With the lack of eligible SEC teams, this matchup could be a long shot. Middle Tennessee or a Conference USA team is in play. An ACC vs Big 10 matchup at Ford Field. An upstart Purdue team would face the Blue Devils. Another possibility would be a MAC team such as Central Michigan or Akron. The current feel is that this will be the Blue Devils destination but some politics are in play so we will wait and see. The Blue Devils will travel to Winston-Salem on Saturday in search of their fifth bowl in the last six seasons. A sixth win will be no easy feat, as the Demon Deacons, led by senior quarterback John Wolford, just knocked off #25 NC State a week ago. Wolford has put together an impressive final campaign for Wake Forest, leading the ACC in passer rating while also adding 10 touchdowns on the ground. The Demon Deacons sit at 7-4 and look to improve their bowl resume with a win over their in-state rival. Containing Wolford and the read option offense will be a challenge for a Jim Knowles’ defense playing without two starters in LB Ben Humphreys and S Jeremy McDuffie. With that being said, the Duke defense has played well enough to keep this team in almost every game on the season, and Saturday should be no different. Daniel Jones and the Blue Devil offense, however, have been far from consistent. After an impressive 4-0 start to September, Duke fumbled their way through a six-game losing streak where they averaged just 12 points per game. As Coach Cutcliffe alluded to this week, “it’s not been any one thing...sometimes it's protection, route running, dropped balls, inconsistency of the run game.” Yet, somewhat inexplicably, Jones and the offense exploded for 43 points last week against Georgia Tech, and here they sit, on the cusp of bowl eligibility. Last week’s effort is a true testament to the Duke coaching staff and senior leaders, who have continued to work and believe in this group despite their struggles. Beyond the obvious, there are a number of interesting storylines to this matchup. Both Cutcliffe and Wake Forest’s Dave Clawson have done commendable jobs at their respective institutions, and it is no surprise that both names have been associated with the current opening in Knoxville. Wake Forest boasts a 2-0 record against North Carolina schools this year, with wins against Appalachian State and NC State. Duke enters the contest also with a 2-0 in-state record against NC Central and North Carolina. As such, an unofficial state championship and bragging rights are on the line Saturday. Amazingly, the Blue Devils are 15-3 in their last 18 match-ups with in-state schools. These two teams have played a number of memorable games over the past several seasons, though the Blue Devils have won four of the last five. With what’s at stake for both teams, this season’s finale should be well worth watching.